Imagine the events that led to those and similarly-grounded judgments as they actually took place in real life. Picture the school where women were held with unrestrained soldiers, the prison camp guarded by drunken, ill-disciplined troops; the compound surrounded by Hutus, where terrified Tutsi women had sought refuge and protection. Place these situations in their very real context of ethnic cleansing and genocide and then ask yourselves if consent could have anything to do, or have any meaning at all, in such circumstances. 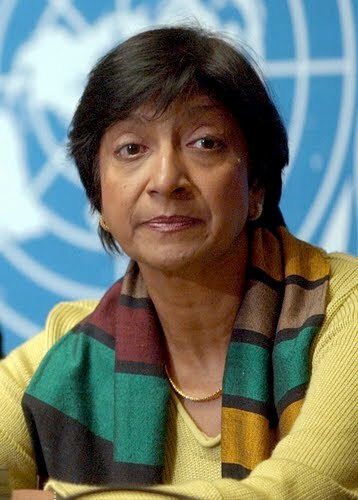 -- Navanethem Pillay (above right), U.N. High Commissioner for Human Rights, former Judge of the International Criminal Court, and former President of the International Criminal Tribunal for Rwanda (prior posts), in "Sexual Violence: Standing by the Victim." Her 2009 lecture appears in a 2010 edition of the Case Western Reserve Journal of International Law, which also includes papers (one by IntLawGrrls' guest/alumna Laura M. Olson) from an "After Guantánamo" symposium.